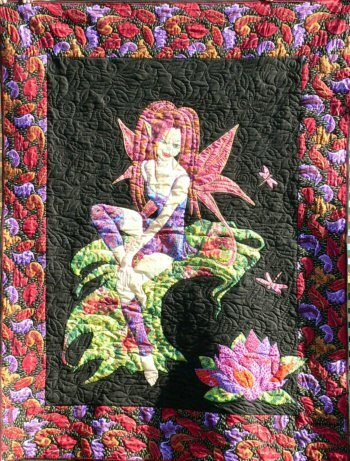 My fairy quilt was a design inspired from a blanket one of my daughters bought while visiting Universal Studios. It was one of those beautifully soft minky blankets. When my grand daughter came to visit it was the blanket she always wanted to use. So with my arty daughters help we set about creating our own version as an applique quilt for her to have at home. 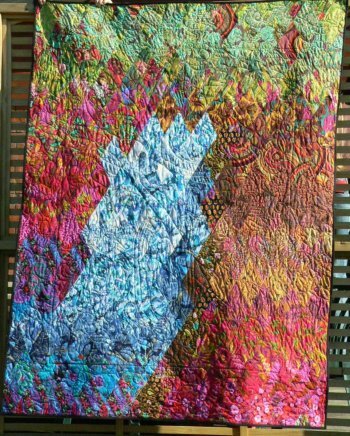 Kaffe Fassett has some stunning fabrics and we felt this quilt was the time to use them. We were not disappointed with the result. The leaf border print of Kaffes we used was quilted quite intensively - each leaf was outlined! Though none of these prints are on his site anymore I presume they are now out of production. 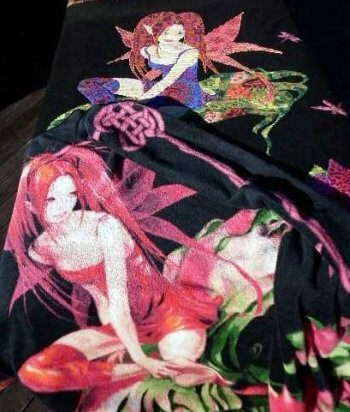 The colors he uses are often found reproduced in each seasons fabrics that he designs. This quilt was made before I had learnt the skill of applique. It's amazing the results one can achieve with limited knowledge but with oodles of inspiration. I used a generic brand of fusible web which I will never use again purely because I eventually came across Steam a Seam and find this is so much better. The wings of the fairy have gold piping around them. From memory I think I zigzag stitched this on. The other challenge I had was getting the hair right. I remember feeling that this part was a bit beyond my skill set at the time. The quilting is stunning and I can't take any credit for this as it was done by my friend Jeannie Balemi. The back of the quilt showing below is a scene of a waterfall set in the forest. The right hand side shows the side of a tree with branches reaching over the waterfall across the top of the quilt. We said that this is where the fairy on the front lived. Once made and given to my grand daughter - guess what happened? She still preferred the fairy minky blanket! One just can't compete with the tactile addiction to the warmth and softness of those blankets!